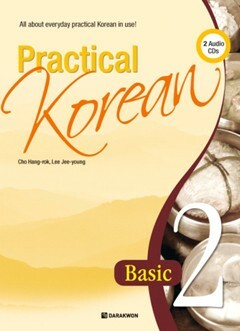 Produktinformationen "Practical Korean 2 Basic - Set mit Workbook and Audio CD"
�Practical Korean� series aims to enable beginners to engage in practical conversations and to develop basic communication skills. As the second volume of the �Practical Korean� series �Practical Korean 2� focuses on the essential vocabulary words, grammar structures, tasks, and topics at a basic level. - Reflecting the theories and know-how of current Korean language teaching methodologies, this book can be utilized both within Korea and abroad. - With six books taking Korean language learners through basic, intermediate, and advanced levels, this series offers intensive language study. - Also, It is published in English version and Chinese version separately to use more convenient for teachers and foreign learners. - Through tasks on various topics, this series offers an integrated language approach to listening, speaking, reading, and writing. - Exercises on each topic ensure effective learning. - The Practical Korean series presents the necessary vocabulary words and expressions required for communicating in real-life situations in Korean. Chapter 1 잡채를 먹어 봤어요? , Have you ever tried japchae? Chapter 2 제 취미는 그림 그리기예요. My hobby is painting pictures. Chapter 3 여행을 가기 전에 표를 예매해야 해요. You have to book the tickets before you leave. Chapter 4 5분쯤 걸으면 지하철역이 있어요. There's a subway station about 5 minutes away. Chapter 6 한 치수 작은 것으로 바꿔 주세요. I'd like to exchange them for a smaller size. Chapter 7 소포를 부치려고 하는데요. I'd like to send this parcel. Chapter 8 어젯밤부터 기침이 심해졌어요. My cough is getting worse since last night. Chapter 9 방에서 담배를 피우면 안 돼요. This room is non-smoking area. Chapter 11 시간이 있으면 우리 집에 놀러 올래요? If you have time why don't you come over to my house? Chapter 12 초대해 주셔서 감사합니다. Thank you for the invitation. Chapter 13 5시에 만날 수 없을 것 같아요. I'm afraid I can't make at 5. Chapter 14 한국에 온 지 5개월이 되었어요. It's been 5 months since I came to Korea. Weiterführende Links zu "Practical Korean 2 Basic - Set mit Workbook and Audio CD"
Unser Kommentar zu "Practical Korean 2 Basic - Set mit Workbook and Audio CD"
Kundenbewertungen für "Practical Korean 2 Basic - Set mit Workbook and Audio CD"